The Jewel Box is probably the least common model of the different diggers made by the Buckley Manufacturing Co., of Chicago, Illinois in the mid-to-late 1930’s. This elegant example could have been placed in an upscale location of the period; such as a fine hotel lobby, railroad station, country club or casino. 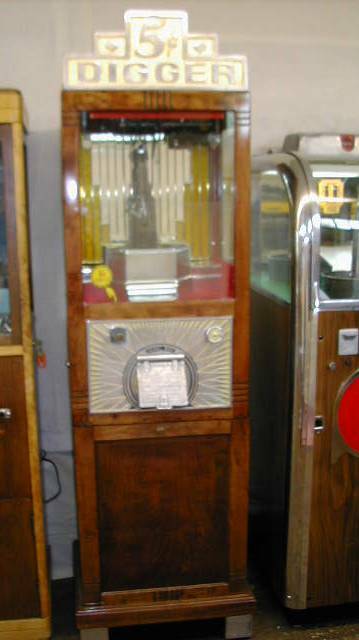 It has been restored in the Vintage Amusements studio/shop to display elegantly and play perfectly. The machine has the correct DuMore AC/DC motor, new cloth covered electrical wire throughout, and operates on a nickel coin by way of the correct 3-bolt push-slide coin mech.